Weight loss is perhaps one of the most frequently made resolutions just like it is also one of the most commonly broken resolves by the middle of February, if not sooner. Everybody looks for a magic pill that can help them effortlessly lose weight, while the experts advice that there is no such pill and that the best way to lose weight is through diet and exercise. Unfortunately, the latter part basically holds true. Also try not to rely too heavily on prescription or over the counter diet pills. Even fad diets can be a pitfall. "Combining proper exercise with a healthy diet is the way to good health." Self esteem is an important aspect of weight loss. Without a hopeful outlook on your situation, you are doomed to fail. You need to always have your goal in sight. Motivation is the will inside us to accomplish whatever goal we set. While it is easy to be motivated at the beginning of any weight loss program, it gets harder and harder to maintain the level of motivation. Commitment is very important in order to follow the lifestyle modifications which any weight loss plan involves. Determination is important because your weight loss goals and the success that you have in losing weight are directly proportional to the amount of determination that you have. Common sense says that you should not put all your eggs in one basket. 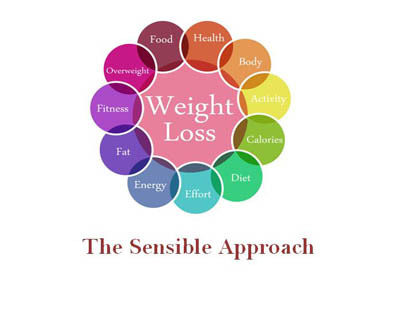 You should approach your weight loss goals from many angles. This will give you a better chance at success. A practical well-planned diet with lots of will power combined with a multitude and variety of exercise options, and a high level of determination will help you to lose weight. Yes, losing weight can be good for your health but it has to be safe too. Change your outlook towards food. Analyze the reasons as to why you tend to overeat. Some possible reasons could be due to boredom, depression, a high stress lifestyle. Set realistic goals, because unrealistic weight loss goals are the most common reason as to why most people lose their motivation. It is important to love yourself and not keep wishing to be someone else. Appreciating yourself and your body will take the pressure off from having to lose weight and this will automatically boost your motivation levels. Focus on the positive points in yourself rather than concentrating on all the negative points. By accepting the way you actually are, you will find that it is easier for you to focus on the good points in you. You need to believe in the diet and exercise regimen which you are following and remember that this type of a healthy lifestyle is not just going to improve your health but also increase your longevity. Following this routine will also boost your self esteem and your confidence.